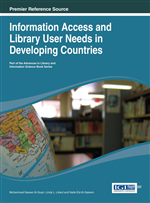 This chapter examines the changing nature of the information environment and its implications for Library and Information Science (LIS), with a focus on developing countries in general and the Arab Gulf states in particular. Drawing on key findings from previous LIS literature, it explores what is needed to ensure the future viability of the profession in the GCC region so that it can help underpin social and economic development in these states. Examples of successful practice in LIS innovation from other parts of the developing world are included to demonstrate some possible approaches and the chapter concludes by summarizing some key points for consideration by LIS education specialists, library managers, and policymakers in the Gulf States. In 1981, the six Arab Gulf countries of Saudi Arabia--Kuwait, Bahrain, Qatar, Oman, and the UAE--formed the Gulf Co-operation Council, with the objective of facilitating “coordination, integration and inter-connection between them in all fields” (The Cooperation Council for The Arab States of the Gulf, 1981). Collectively, these countries cover around 3 million sq. kilometers and have a total population of about 30 million, 27 million of whom live in the largest of the GCC states, Saudi Arabia. (Al-Mulhim, 2012) These oil rich countries have experienced rapid development since the Gulf oil boom of the early 1970s and have encouraged high levels of labor in-migration to meet the demands of their growing economies. There is high population growth across the region from natural increase as well as immigration: the total population has been forecast to increase to 53 million in 2020, with the majority under 25 years of age (Economist Intelligence Unit, 2009). The oil reserves on which these countries have built their economies are projected to run out in the near future, and policymakers are now turning their attention to the pressing need to diversify economies to reduce their dependency on oil (Business Monitor International, 2010). Already, between 60 and 70% of GDP in the UAE and Bahrain is accounted for by sectors other than the oil industry (Samba Financial Group, 2011).